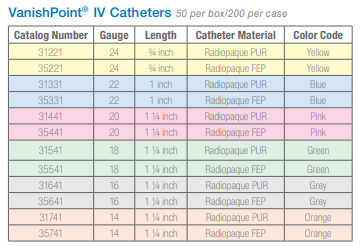 The VanishPoint IV Catheters, by Retractable Technologies, is available in a variety of gauges and lengths. The IV catheter is color coded on both the catheter hub and housing to indicate the gauge size. It's made with the patented automated retraction safety feature to protect the caregiver from accidental needle stick injuries that can expose the caregiver to a contaminated needle. After the caregiver performs venipuncture, the color coded end of the needle housing is depressed before the needle is withdrawn to activate the retraction of the needle into the housing. There are two material options for the VanishPoint IV Catheter - polyurethane PUR or FEP. PUR has a more flexible material aiding in comfortable in-dwelling and FEP catheters have a firmer construction needed for easier arterial access. Both options offer clear finger grips and push-off tab to allow for easy one-handed insertion. 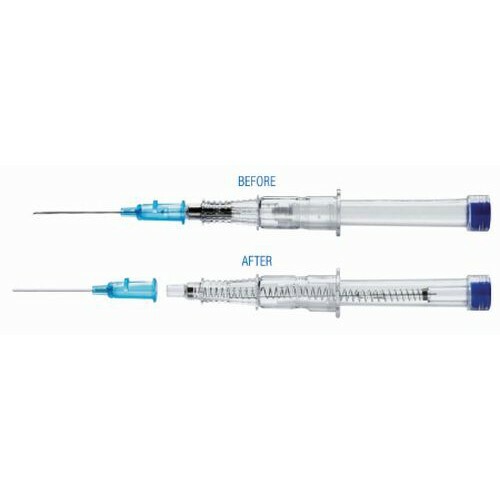 The introducer needle is sharp which makes the insertion fast and easy for caregiver and therefore makes it insertion easier on the patient as well. The IV Catheter is radiopaque material making it visible in x-ray photos. You may be in interested in other IV Supplies as well as skin venipuncture preparation such as Povidone Iodine Prep Solution.